The Philippine National Police confers awards and medals on its members in due recognition of outstanding performance. This policy was established by virtue of NAPOLCOM Memorandum Circular No. 93-018 issued by the National Police Commission, dated September 23, 1993, with the subject “Prescribing the Authorized Decorations, Service Medals, Ribbons, and Badges of the Philippine National Police” as amended by NAPOLCOM Memorandum Circular 2006-003 dated November 30, 2006. The Medalya ng Kagitingan or the PNP Medal of Valor is the highest award of the Philippine National Police. 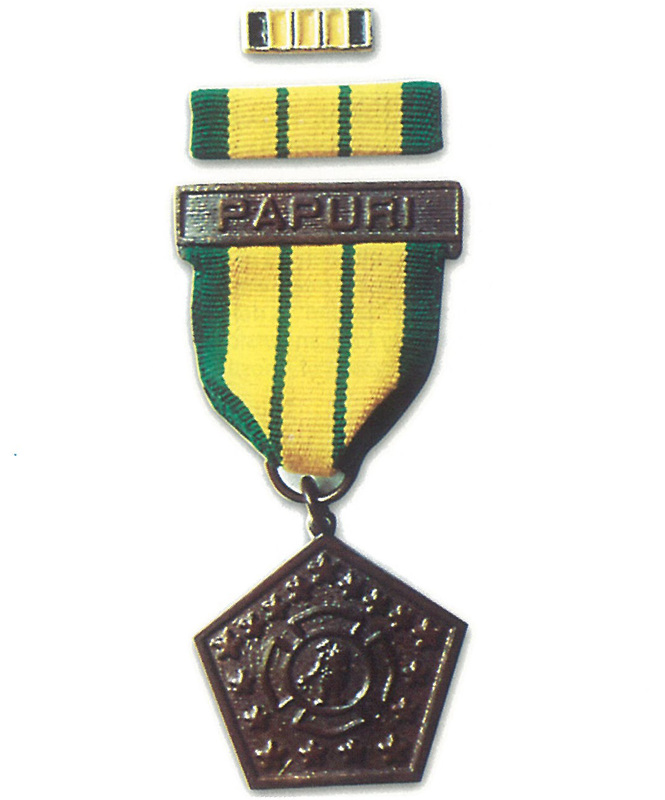 It is awarded to any member of the Philippine National Police who have performed in action a deed of personal bravery and self-sacrifice above and beyond the call of duty so conspicuous as to distinguish himself clearly above his comrades in the performance of more than ordinary hazardous service. This award may be given only if the enemy force is so overwhelming as compared to the government troops. A golden cross with triangle at the center. Inside the triangle are three stars. Projected around the cross is a sampaguita wreath. The cross is suspended by a link from a gold bar bearing the inscription “KAGITINGAN”. On the reverse side of the bar are stamped the words “The President to” engraved the name, grade and organization of the recipient and below it is the place and date of the act for which the medal is awarded. 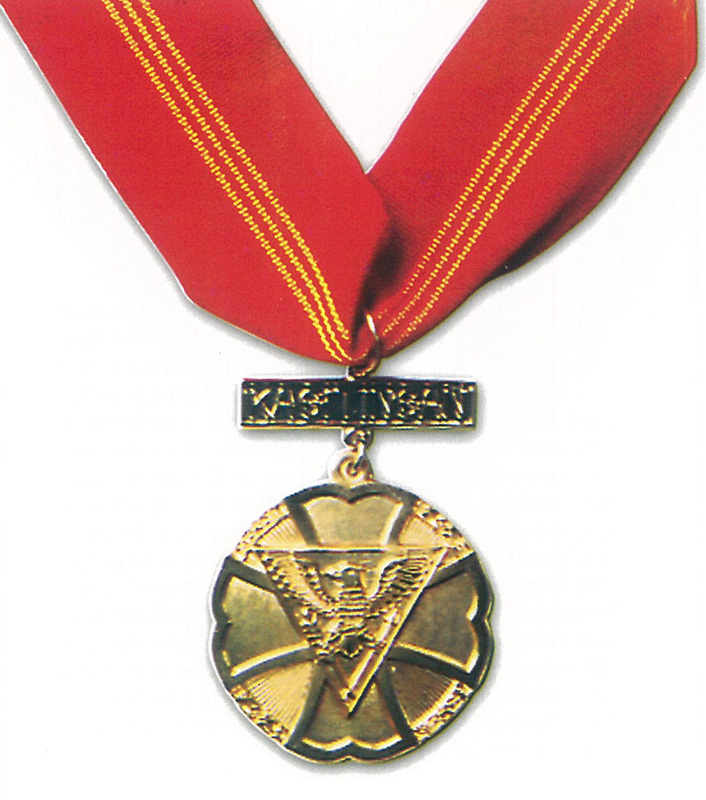 The medal is suspended from a neckband of the red silk gold stripes at the center 1/6 inch in width and 1/6 inch apart. The service ribbon for this award shall bear three golden stars at the center bar. 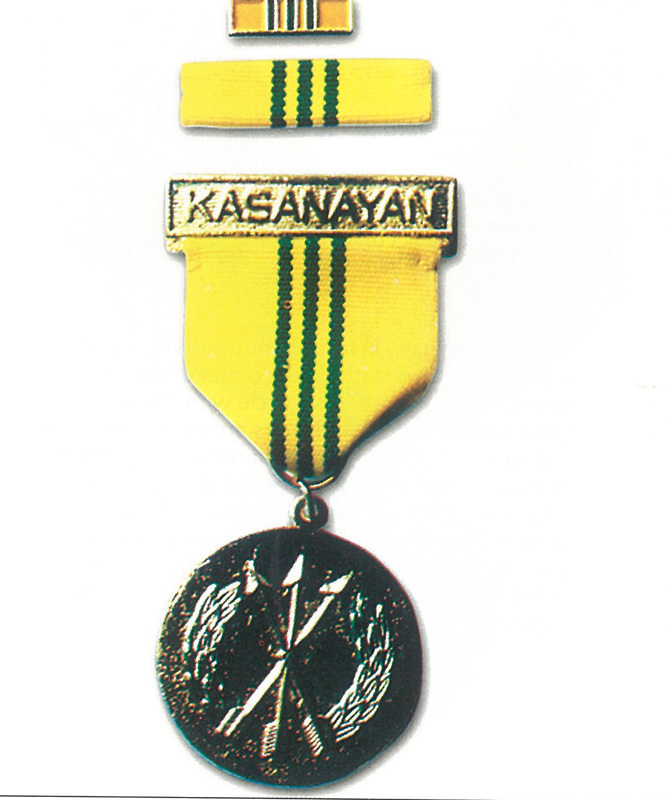 The Medalya ng Kabayanihan is awarded to uniformed members of the Philippine National Police for acts of conspicuous courage and gallantry in the face of an armed enemy or act of heroism so notable and involving a risk of life so extraordinary as to set him apart from his comrades. A golden cross with a Kampilan and Spear intersecting diagonally at the space between the four arms of the cross. Superimposed at the center of the cross is the seal of the PNP. At the outer fringes of the PNP seal is a ring where seventeen stars consisting of thirteen small stars and four big stars are symmetrically arranged. At the reverse side of the medal on a molded stripe are engraved the name, grade and organization of the recipient and below it is the place and the date of the act for which the medal is awarded. 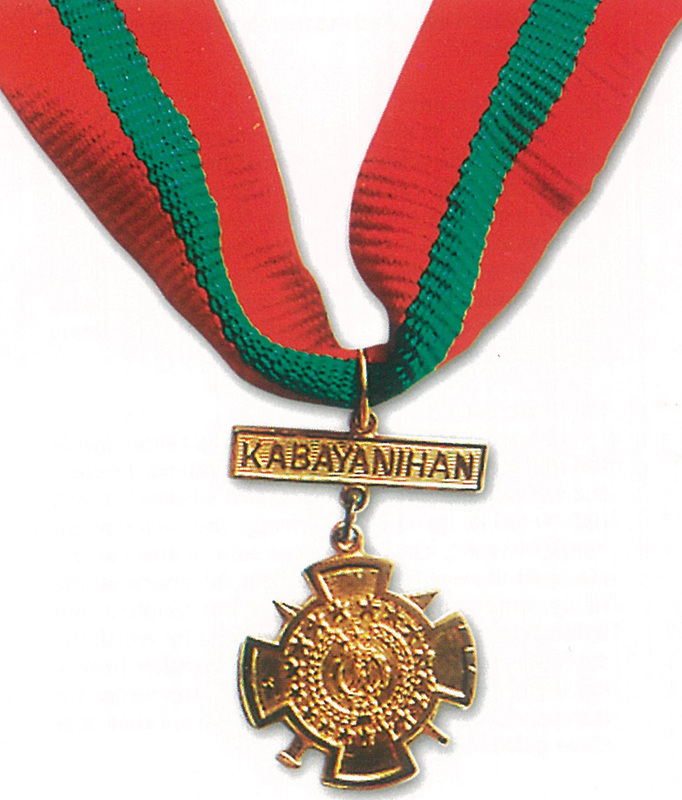 The medal is suspended from a gold bar bearing the inscription ‘KABAYANIHAN”. The bar is suspended from a neck band of red silk moire 13/8 inches in width and 20 inches in length with a green line at the center and 5/16 inch wide. The service ribbon for this award shall bear the PNP seal placed at the center within the green band of the ribbon. Medalya ng Katapatan is awarded to members of the Philippine National Police for exceptional performance of major responsibility duly recognized as such by the service. The accomplishment of the duty should have been complete prior to submission of recommendation or, if the person being recommended has been transferred prior to completion, the accomplishment must have been determined to be exceptional or significant. A golden cross with the PNP seal at the center. The seal is surrounded by a sampaguita wreath. On the four arms of the cross are seventeen stars distributed as follows: on the top arm are three small stars; on the left and right arms are five stars each, one big star flanked by two small stars on each side, and at the bottom arm are four stars consisting of two big stars sandwiching two small stars. On the reverse side of the medal, the words ‘ PAGLILINGKOD SA BAYAN”, name, grade and organization of the recipient as well as the place and date of service or services for which the medal is awarded are engraved. 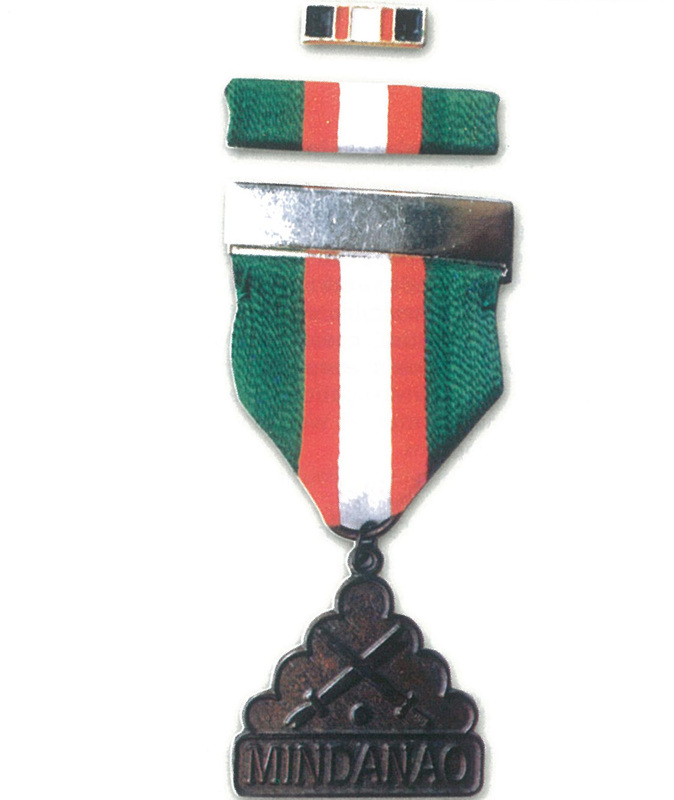 The medal is suspended from a neckband of green silk moire 13/8 inches in width and 20 inches in length with a red line at the center. 5/16 inches in width. The service ribbon for this award shall bear the PNP seal placed at the center within the red band of the ribbon. 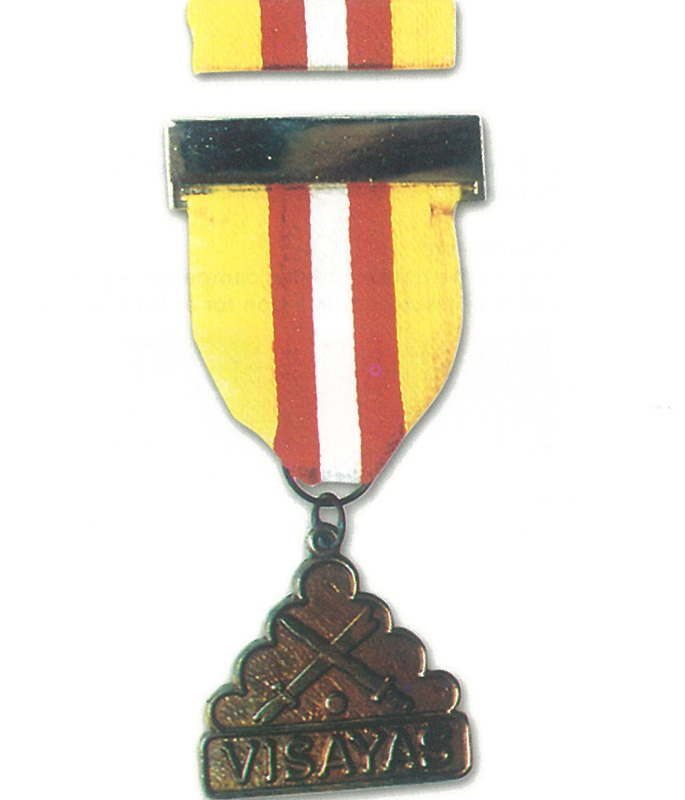 The decoration Medalya ng Katapangan or the PNP Medal of Bravery is the fourth highest award of the Philippine National Police, corresponding to the Gold Cross Medal of the Armed Forces of the Philippines. It is conferred on members of the Philippine National Police who have exhibited gallantry in action. To qualify, awarded personnel must have had to face a superior enemy force in actual combat. The enemy must be superior to the government troops during the actual combat by at least eight (8) but not more than twenty (20) combatants. The medal is in the shape of a golden spearhead pointing downward. At the center of the spearhead is a Kampilan placed vertically with the blade at the top superimposed over a sampaguita wreath. At the base of the spearhead is a space where three stars are arranged horizontally. At the back of the medal, the name, grade, and organization, as well as the place and date of the act for which the medal is awarded are engraved. 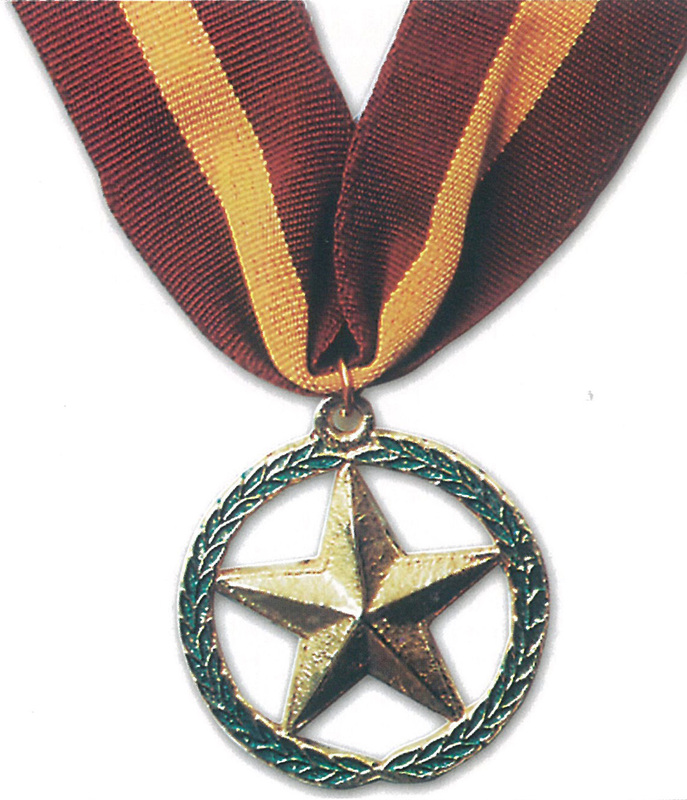 The medal is suspended from a maroon silk moire ribbon 13/8 inches in width and 13/8 inches in length with three white stripe s in the center 1/16 inch wide and spaced 1/16 inch apart. The ribbon is attached to a bar with the inscription “Katapangan.” It was conferred by President Benigno S. Aquino III on the fallen SAF personnel who died in Mamasapano, Maguindanao. 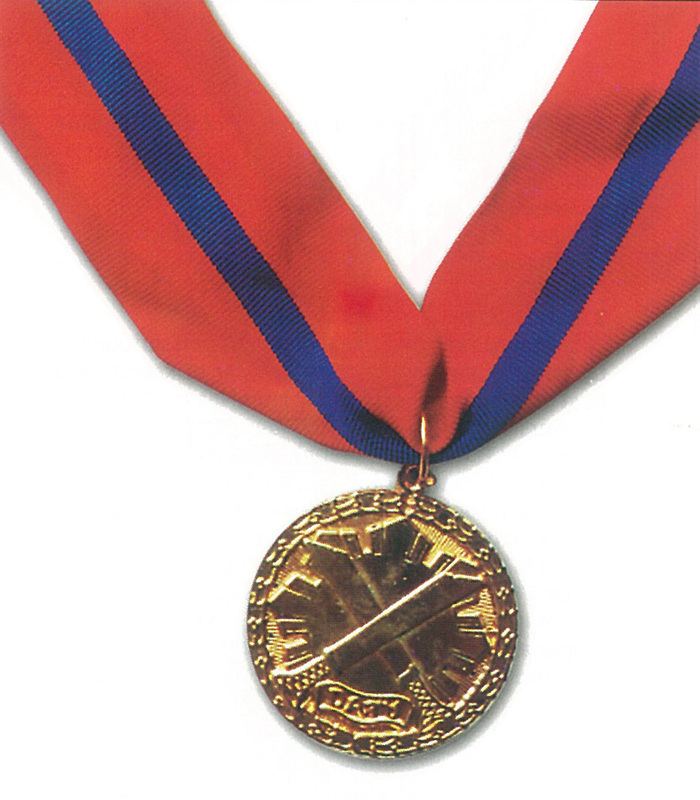 The Medalya ng Katangitanging Gawa is awarded to PNP members and civilian personnel of the Republic of the Philippines and of friendly foreign nations for distinguished or extraordinary achievement or service in the advancement of science, socio-economic, technical and/or police related to public service of the highest order. The medal shall be gold-plated bronze star two inches in diameter surrounded by a circular laurel leaves symbolizing excellence, suspended by a bronze link from a silk moire neckband two inches in width and 26 inches in length. 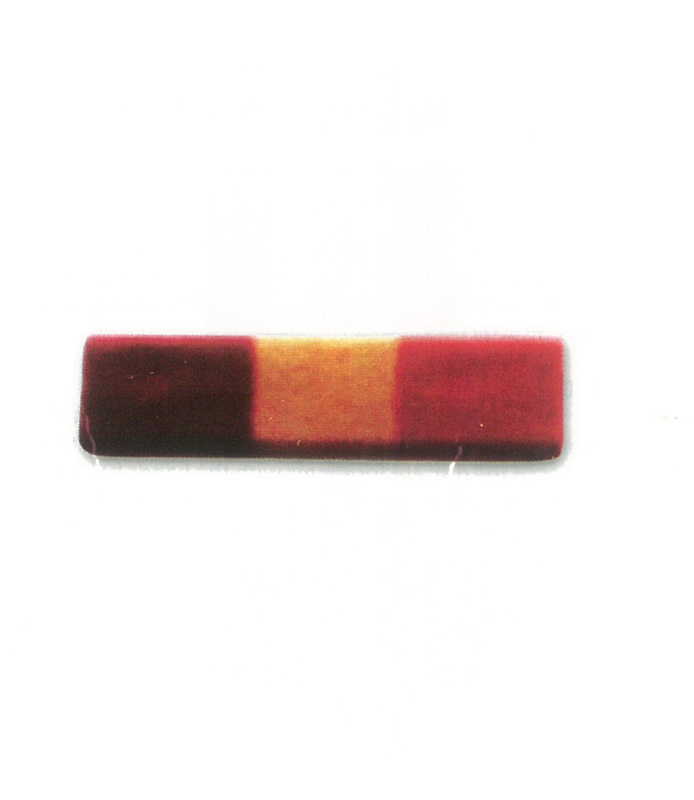 The color of the neckband is maroon with a gold stripe at the center ½ inch wide. 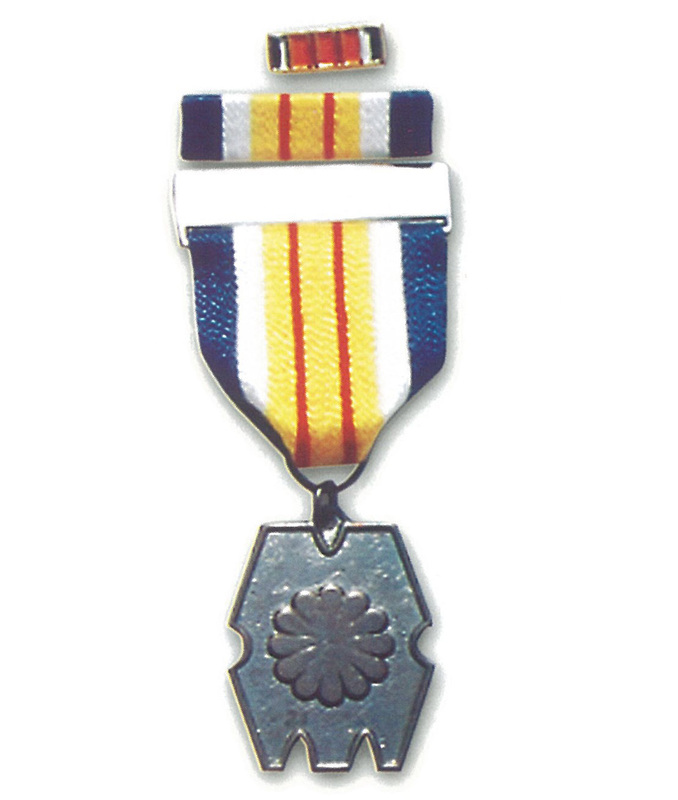 On the reverse side of the medal are engraved the words “ OUTSTANDING ACHIEVEMENT MEDAL” and “Awarded by the Secretary of the Interior and Local Government”. The Medalya ng Pambihirang Paglilingkod is awarded to any member of the Philippine National Police and police personnel of friendly foreign nations for eminently meritorious and invaluable service in the field of police operations while in position of major responsibility. The performance of duty must be such as to merit recognition by the service as exceptional. A golden wheel with five spokes bounded by sampaguita wreaths. At the center of the wheel is the bust of Lapu-Lapu flanked by two (2) laurel leaves and six small stars at the outer left and seven small stars at the outer right. Just above the head of Lapu-Lapu are four big stars and below is the enclosed inscription of ‘DATU”. The disc is suspended by a link from a neckband of blue silk moire 13/8 inches in width and 20 inches in length with a red line at the center 5/16 in width followed by yellow stripes on both sides ¼ inch wide. Medalya ng Kadakilaan to members of the Philippine National Police for heroism not involving actual conflict with an armed enemy. A bronze kalasag in its upright position surrounded by a sampaguita wreath. At the center of the Kalasag is the bust of Lapu-Lapu encircled by laurel leaves. The three stars are engraved on the kalasag distributed as follows: at the center just above the bust of Lapu-Lapu and at the left and right corners of the kalasag below the bust of Lapu-Lapu. 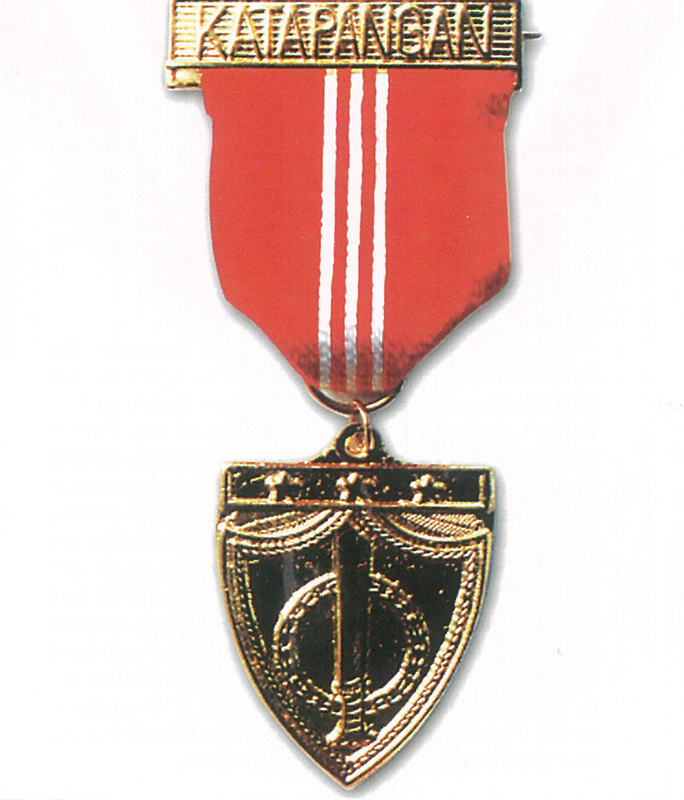 The medal is suspended from a red silk moire ribbon 13/8 inches in width and 13/8 inches in length. At the center of the ribbon is a blue stripe 3/8 inch wide. On both sides of the blue stripe are white stripes 1/16 inch wide; next to the white stripes are red stripes 3/16 inches in width; followed by white stripes 1/16 inch in width; and at the end, red stripes 3/16 in width. The ribbon is attached to a bar with the inscription of “kadakilaan”. 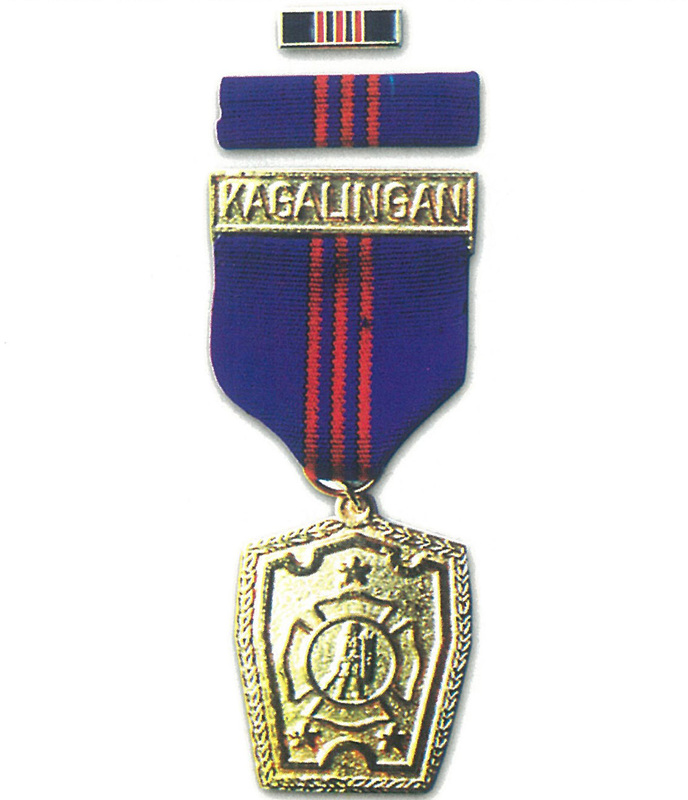 The Medal ng Katangitanging Asal shall be awarded to any quasi-police force member or other civilian volunteers for the heroic acts by the individual while in action involving actual conflict with an enemy in a crime situation or life-saving situation, distinguishing himself conspicuously by gallantry and intrepidity at the risk of life above and beyond the call of duty. A circular disc. On the fringes of the disc is a sampaguita wreath. At the center of the disc are two kampilans crossed diagonally, superimposed over a sun with eight rays. At the center below the kampilan is the enclosed inscription “DATU”. At the back of the medal, the word “KATANGITANGING ASAL” are engraved. 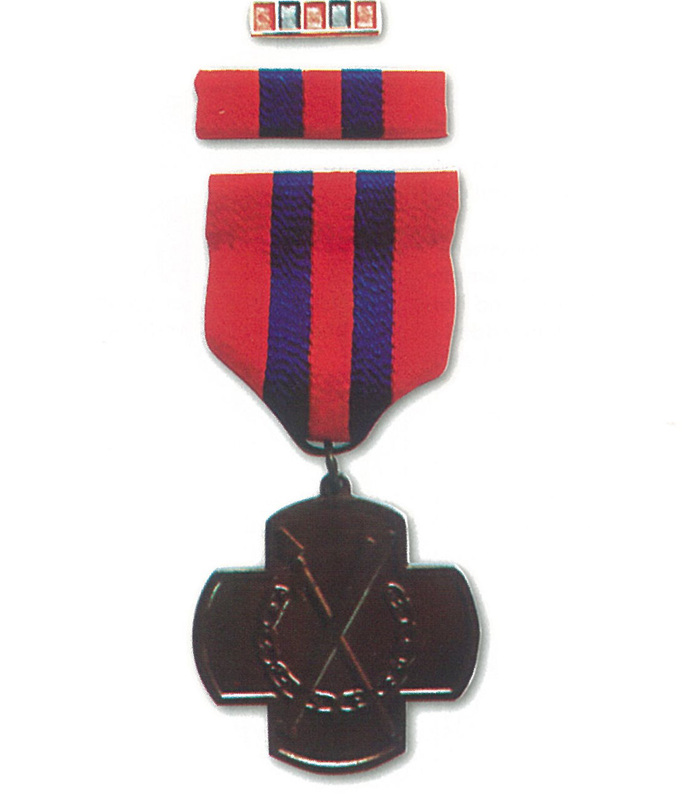 The medal is suspended from a neckband of red silk moire 13/8 inches in width and 20 inches in length with three blue stripes at the center ¼ inch in width spaced 3/8inch apart. The service ribbon of this award shall bear the degree of the award in a scroll placed at the center of the ribbon. Medalya ng Kagalingan is awarded to members of the Philippine National Police for a single act of heroism or a series of heroic acts in a duty responsibility not warranting the award of Medalya ng Kadakilaan. A gold kalasag in its upright position surrounded by a sampaguita wreath. At the center of the kalasag is a cross. Inside the cross is a circle with the embossed figure of Lapu-Lapu. Three stars are engraved on the Kalasag distributed as follows: at the center just above the top arm of the cross and at the left and right corners of the bottom arm of the cross. The medal is suspended from a blue silk moire ribbon 13/8 inches in width and 13/8 inches in length with three red stripes at the center 1/16 inch in width and spaced 1/16 inch apart. 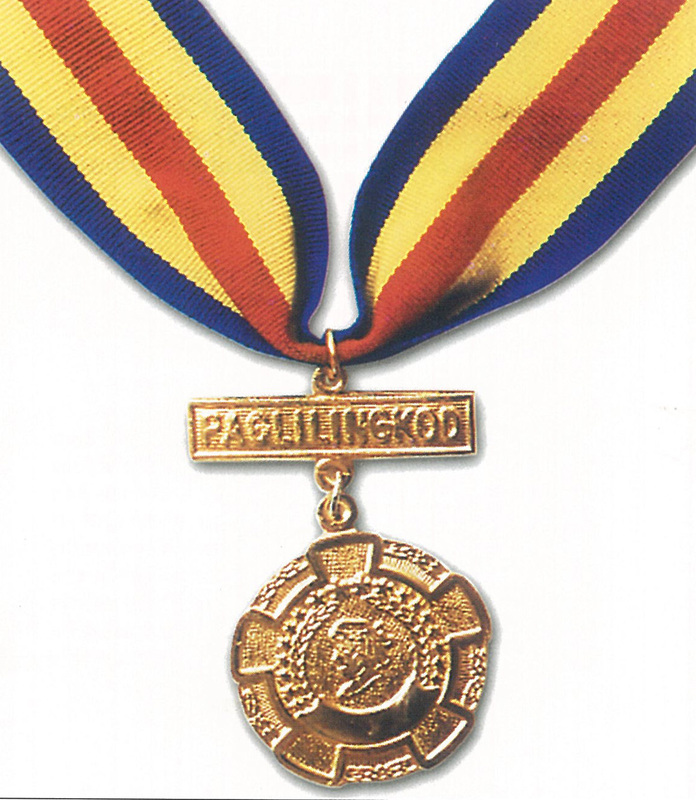 The medal is attached to a bar with the inscription “Kagalingan”. Medalya ng Kasanayan is awarded to members of the Philippine National Police for eminently meritorious and invaluable service to merit recognition by the service as exceptional. A circular gold disc with three arrows bound together by a knot at the center and two sampaguita leis of equal length on both sides of the bundled arrows. The medal is suspended from a yellow silk moire ribbon 13/8 inches in width and 13/8 inches in length with 3 green stripes at the center 1/16 inch in width and 1/16 inch apart. 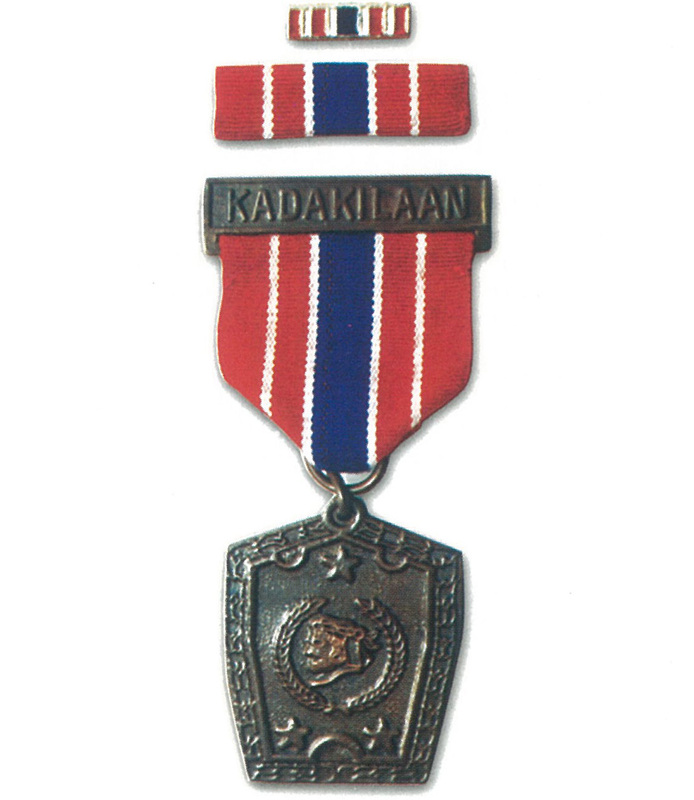 The medal is attached to a bar with the inscription “Kasanayan”. Medalya ng Papuri is awarded to members of the Philippine National Police for demonstrated exemplary efficiency, devotion and loyalty to their duty assignments. A bronze medal in the shape of pentagon is the figure of Lapu-Lapu. Distributed symmetrically are four big stars at the four bottom corners sandwiching two small stars each. Overhead the figure of Lapu-Lapu are seven small stars. 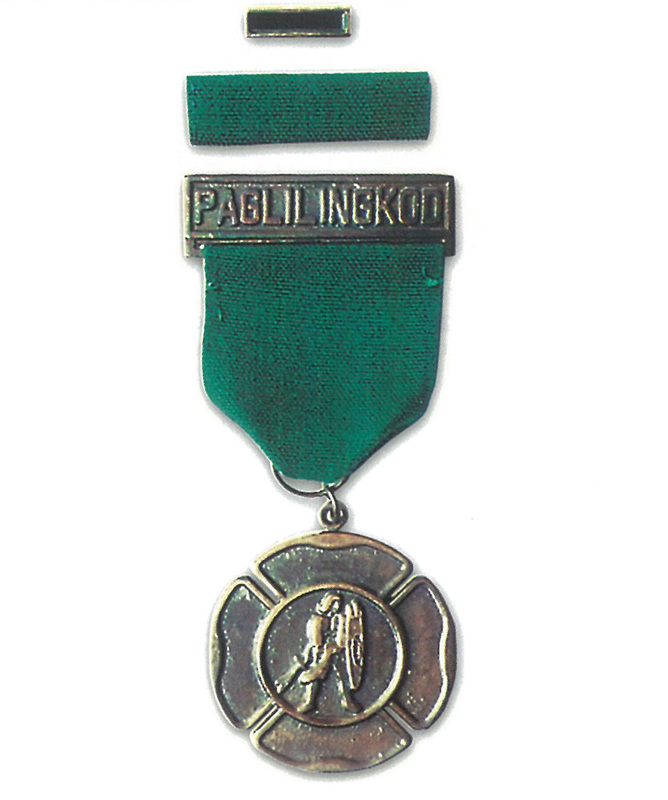 The medal is suspended from a green silk moire ribbon 13/8 inches in width and 13/8 inches in length with three yellow bands at the center ¼ inch in width and spaced 1/16 inch apart. The ribbon is attached to a bar with the inscription “Katapatan”. Medalya ng Sugatang Magiting is awarded to members of the Philippine National Police for having been wounded in action against an enemy, as a direct result of an act of the enemy provided such wounds necessitate treatment by a medical officer. For this purpose, a “wound” is defined as an injury to any part of the body from an outside force, element or agent sustained as a result of a hostile act of the enemy. A circular silver disc with the figure of Lapu-Lapu at the center. The medal is suspended from a violet silk moire ribbon 13/8 inches in width and 13/8 inches in length with a white stripe at the center 5/16 inches width. 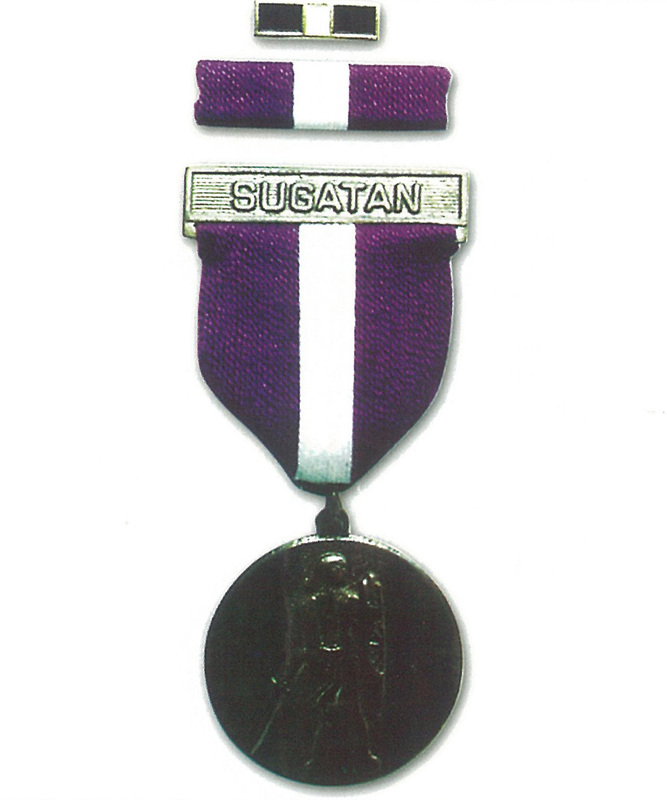 The ribbon is attached to a bar with the inscription “Sugatan”. Medalya ng Ugnayang Pampulisya is awarded to members of the Philippine National police for meritorious achievement in the field of police relations. A bronze kalasag with a white sampaguita cluster at the middle. It is suspended from a ribbon with a blue stripes at each side and white, yellow, red, yellow and white stripes at the center. The ribbon is attached to a gold bar. Medalya ng Mabuting Asal is awarded to members of the Philippine National Police for conspicuous devotion to duty extended to a period of five (5) years without record of punishment, conviction or derogatory information whatsoever. A bronze sampaguita flower bound by a sampaguita lei. It is suspended from a green silk moire ribbon 13/8 inches in width and 13/8 inches in length with white stripe at the center 5/13 inches in width, attached to a silver bar. Medalya ng Paglilingkod is awarded to members of the Philippine National Police for completion of a t least twenty (20) years of faithful and honorable service. One silver star shall be added on the ribbon for every additional five (5) years of service. A bronze cross with an inner circle at the center of which is the figure of Lapu-Lapu. 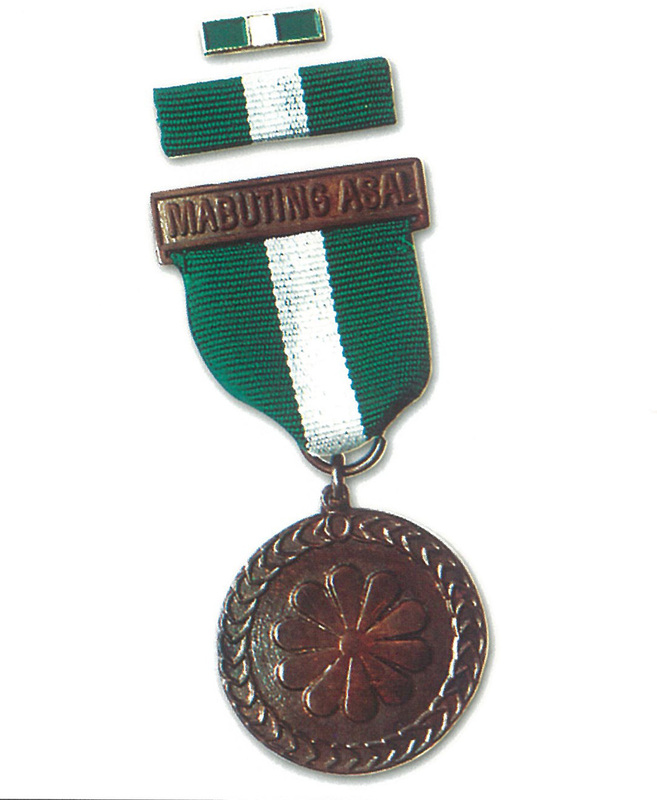 The medal is suspended from a green silk moire ribbon 13/8 inches in width and 13/8 inches in length. Attached to a bar with the inscription “Paglilingkod”. 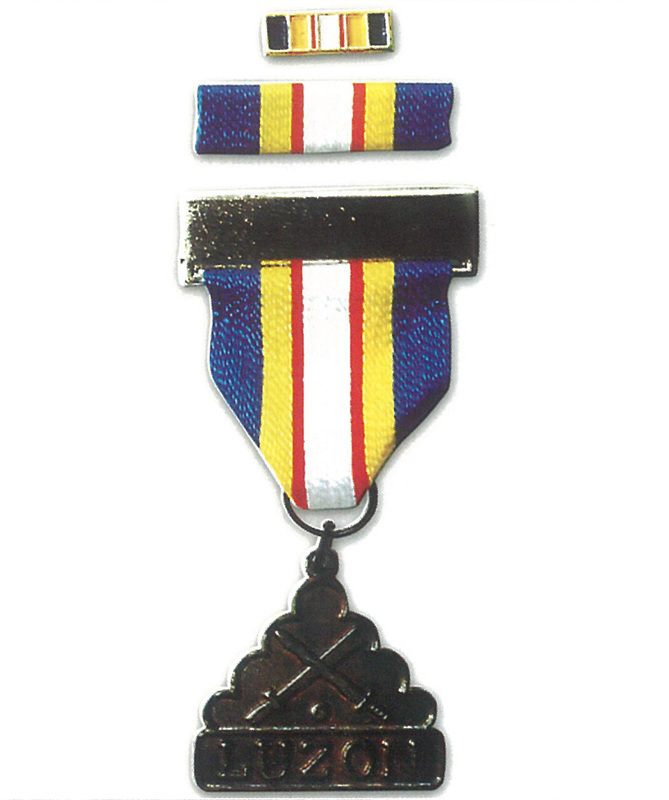 Medalya ng Paglaban sa Manliligalig is awarded to members of the Philippine National Police, for active service for any period of six (6) months while undertaking an operation, campaign or movement against the dissidence between January 1991 and a terminal due date to be designated later. A bronze cross with a spear and kampilan crossed diagonally at the center superimposed over a sampaguita wreath. The medal is suspended from a red silk moire ribbon 13/8 inches in width and 13/8 length with two blue bands 5/16 inches in width and spaced ¼ inch apart. Medalya ng Pagtulong sa Nasalanta is awarded to members of the Philippine National Police for active participation in an undertaking involving rescue/relief and rehabilitation operations connected with typhoons, floods, earthquakes, conflagration, and other disasters/calamities for any period during and after disasters/calamities. A circular bronze disc with a sampaguita wreath running along the circumference of the disc. At the center of the disc are four arms with the hands holding the forearms of another forming a square. At the center of the square are three stars of equal size arranged in one horizontal line. 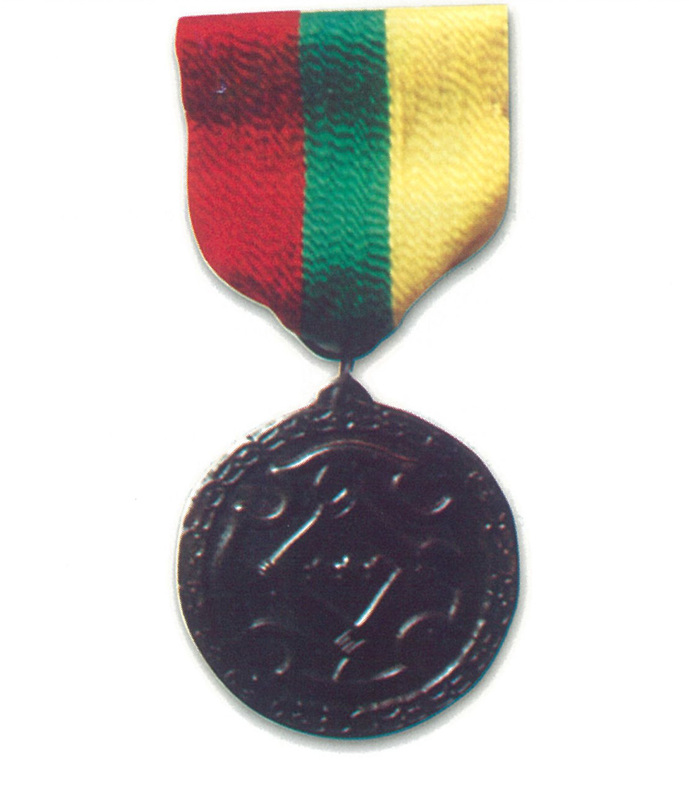 The medal is suspended from a ribbon 11/3 inches in width and 11/3 inches in length divided equally into three bands colored maroon, green and gold. Tsapa sa Natatanging Yunit is awarded to units of the Philippine National Police for acts and services or exceptional devotion and fidelity. The badge shall be rectangular bar bordered with gold embossed with anahaw leaves signifying triumph and glory. The whole bar shall be of maroon, yellow and orange colors divided equally. Medalya ng Paglilingkod sa Luzon is awarded to members of the Philippine National Police for participation in the campaign against criminality or insurgency in Luzon for at least six (6) months. A bronze medal with a shell and central pearl configuration with a crossed kris and kampilan atop and a silver bar at the base with the word “Luzon” inscribed thereon. It is suspended from a ribbon with blue stripes at each side and yellow, red and white stripes at the center. Medalya ng Paglilingkod sa Visayas is awarded to members of the Philippine National Police for participation in the campaign against criminality or insurgency in Visayas for at least six (6) months. A bronze medal with a shell and central pearl configuration with a crossed kris and kampilan atop and a silver bar at the base with the word “Visayas” inscribed thereon. It is suspended from a ribbon with blue stripes at each side and yellow, red and white stripes at the center. The Medalya ng Paglilingkod sa Mindanao is awarded to members of the Philippine National Police for participation in the campaign against criminality or insurgency in Mindanao for at least six (6) months. A bronze medal with a shell and central pearl configuration with a crossed kris and kampilan atop silver bar at the base with the word “Mindanao” inscribed thereon. It is suspended from a ribbon with blue stripes at each side and yellow, red and white stripes at the center. Mga Tsapa ng Kuwalipikasyon are awarded to members of the Philippine National Police for ability in specialized fields such as water surface operations, underwater operations, airborne, navigation, marksmanship, surveillance, electronics and technical expertise, special weapons, ordinance, explosives, chemical weapons, operations such as patrol, traffic, investigation, vice control, juvenile delinquency control, as well as administrative and auxiliary functions. Description of authorized qualification badges are prescribed in corresponding governing circulars. The Medalya ng Kagitingan shall be awarded by the President of the Philippines. The Medalya ng Kabayanihan and Medalya ng katapatan sa Paglilingkod shall be awarded by the Secretary of the Interior and Local Government. The Medalya ng Katapangan, Medalya ng Katangitanging Gawa, Medalya ng Pambihirang Paglilingkod and Tsapa sa Natatanging yunit shall be awarded by the Chief, Philippine National Police. The Medalya ng Kadakilaan, Medalya ng Katangitanging Asal, Medalya ng Kagalingan, Medalya ng Kasanayan, Medalya ng Papuri, Medalya ng sugatang magiting, Medalya ng Ugnayang Pampulisya, Medalya ng Mabuting Asal, Medalya ng Paglilingkod, Medalya ng Paglaban sa Manliligalig, Medelya ng Pagtulong sa Nasalanta, Medalya ng Paglilingkod sa Luzon, Medalya ng Paglilingkod sa Visayas, Medalya ng Paglilingkod sa Mindanao are awarded by the Chief, Philippine National Police, Directors of the PNP Regional Commands and Directors of National Service Support Units. 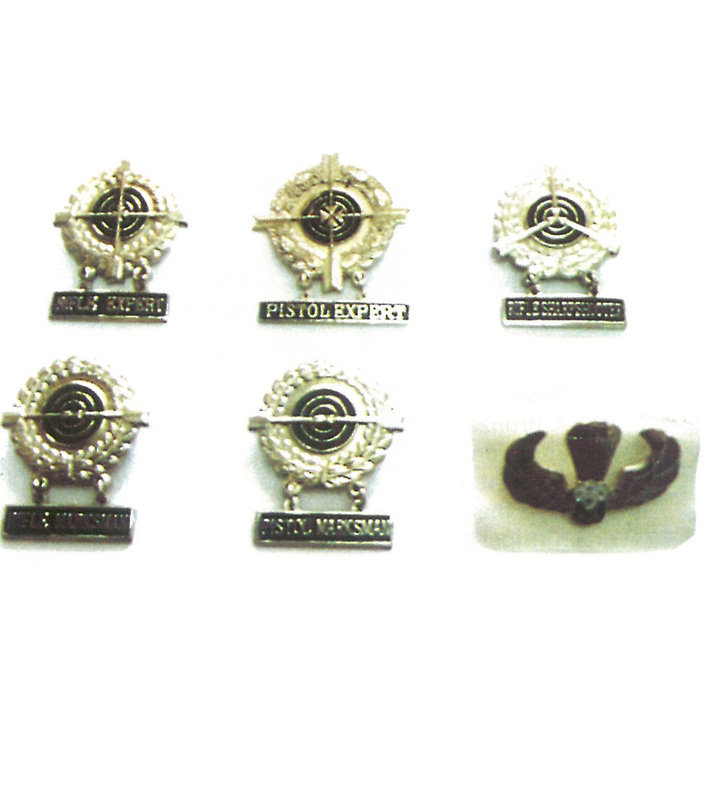 Authority for the awarding of the PNP Qualification Badges shall be in accordance with the governing circulars. Awards of medal(s) may be made following the death of the person being honored in the same manner they are made for a living person except that the orders and citations will indicate that the award is being made posthumously. 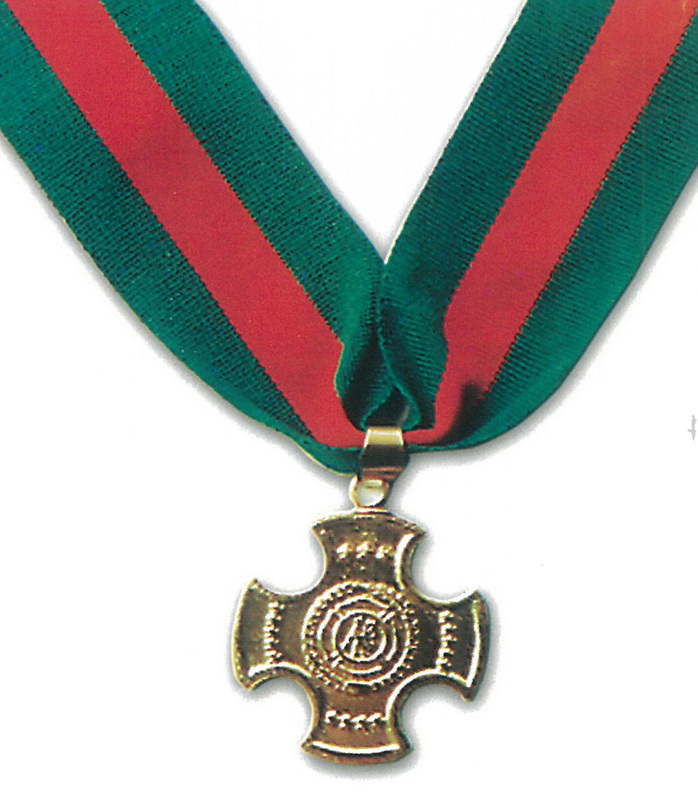 In case an individual who is distinguished .dies before the making of an award to which he may be entitled , the award may nevertheless be made and the medal, star, bar, or other emblem or device, may be presented within three (3) years from date of the act justifying the award thereof, to such representative of the deceased as the Chief, PNP may designate. Eligible classes next of kin are, in the order of precedence, widow or widower, eldest son, eldest son, eldest daughter, father, mother, eldest brother, eldest sister, or eldest grandchild. “NAPOLCOM Memorandum Circular No. 93-018”, Official Gazette Online, retrieved on March 6, 2015 from http://www.officialgazette.gov.ph/1993/09/23/2671/. “PNP Awards and Incentives”, Philippine National Police: Police Regional Office 9, retrieved on March 6, 2015 from link.